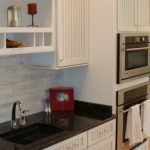 By utilizing these features and the many design options that are available, you can make your outdoor living space inviting, comfortable and aesthetically pleasing. If you are surrounded by a breathtaking view, you should strongly consider adding a wraparound deck to your home so that you can enjoy the view from every possible angle. Not only will you be able to appreciate the gorgeous panoramic views afforded by a wraparound deck, but you will also have plenty of space to create different areas devoted to specific activities. With a wraparound deck, it is also possible for you and your guests to head directly to a favorite spot on the deck without ever having to step foot inside your home. 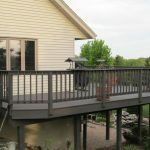 A multi-tiered deck is a visually appealing option for any type of terrain, and it is an excellent choice if you have steep slopes in your backyard. Regardless of the terrain of your yard, a tiered deck offers many benefits. One tier can be designated as an area that is for entertaining, while another can be used for relaxation. Another area can be used solely for cooking, or you can use the tiers to create areas for gatherings and other areas for privacy. 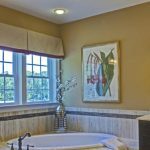 The great thing about tiers is that they not only provide multiple vantage points from which you can enjoy your view, but they also represent a more attractive and interesting option in terms of the possible design elements. Need to find a pro for your deck design? 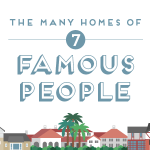 While it is fairly customary for decks to be attached to the house, this does not necessarily have to be the case. 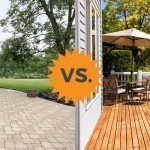 If there is an area of your yard that is underutilized or offers a particularly nice view that deserves appreciation, consider investing in a walkway that leads to a destination deck. The walkway can be lined with all kinds of plants or other decorative elements, and the deck itself can be any size that you deem appropriate. Every great deck should include a great focal point, and one of the best focal points has to be a fire pit. The pit can be placed on the deck, beyond the deck or the deck can even be built around the pit. No matter what type of fire pit you choose and where you place it, you will be sure to enjoy sitting around the fire regardless of the time of year. 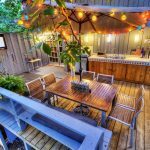 Of course, fire pits are not the only focal point that you can include, as many people opt for an outdoor kitchen and bar to make their decks absolutely perfect for hosting purposes. 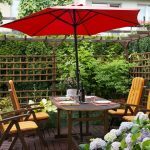 Whether you already have a deck or are considering installing one, pergolas are becoming an increasingly popular option to invest in due to the stylish appearance, practicality and versatility of these structures. Visually appealing and customizable, a pergola can be used to create an area that is shaded and even a bit more private. 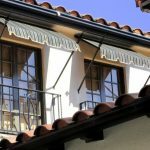 You can drape your pergola with plenty of plants to make it feel like the ideal natural escape, or you can opt for a lean modern design that emphasizes the clean lines of the pergola. 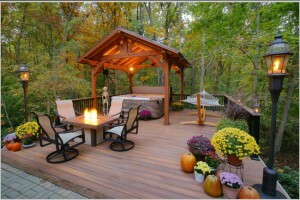 Either way, you will enjoy sitting on your deck that much more when you are able to sit beneath the shade of a pergola. When you have a great view from your deck, the last thing that you want to do is anything that will obscure the view. Of course, you cannot simply avoid railings altogether, so make sure that you use railings that preserve your gorgeous views. 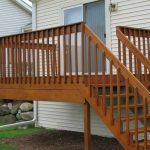 There are various options that are suitable for any deck design imaginable, so whether you prefer a contemporary design or a rustic design, there is a railing option that is ideal for your needs. So while others are out shopping for raised chairs so they can see over their railings, you will be able see your views from any piece of furniture on your deck. Just as a fire pit can serve as an ideal focal point for your deck, so too can a water feature complement whatever deck you ultimately choose. There are countless options when it comes to water features, as you can opt for something as simple as a vase that consistently recirculates water so that it sounds like you are close to a stream, or you can choose something more involved like a koi pond or custom waterfall. When you build your deck, you may want to consider adding some built-in seating. A few simple benches will ensure that your deck does not become overloaded with furniture each time you host a social gathering. Another benefit of utilizing built-in seating is that you can include storage areas inside of these benches, giving you a great place to store a variety of outdoor items. This could be anything from your outdoor furniture cushions or all of the toys the kids tend to leave out each day. If you really want to enjoy your deck throughout the day and the night, think about adding lighting throughout the area. 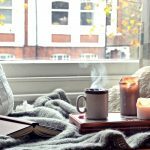 These do not have to be particularly bright, but a few well-placed lights can really improve the outdoor ambiance and allow you to take advantage of your deck’s comfort regardless of the time of day. With so many excellent deck options available to you, there is simply no doubt that you will be able to create an ideal space that is inviting, comfortable and aesthetically pleasing.